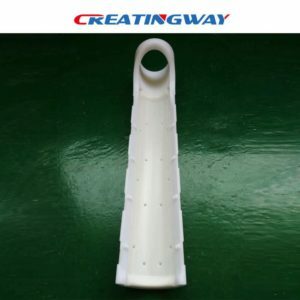 Creatingway provide you much more medical parts CNC machining parts from development, trail order till low-volume production, we own more advantages CNC machine centers and milling machines to services your projects, and our professional engineer team are closely work with you for your projects in order to ensure each of details meet requirement, we have been worked more bike parts like wheel, axis, frames components. Parts machining process: CNC milling and turning, CNC Lathe. 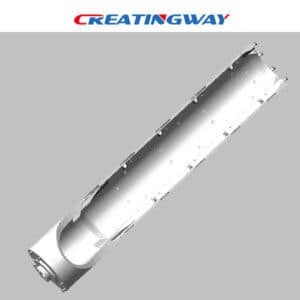 We know that POM-C material is very easy deformation during machining. Even that it will be easy deformation when temperature changed, since the overall size of parts is too long and thickness is too thin, 1.5mm. The main process used to make the body part, as this whole length is too long, and so easy deformation, Meanwhile, its dimension will be changed under different temperature, this will take very big challenge to us, we have taken 1 weeks time to complete it under average condition. When we have completed the parts, we must to make it with top parts match and assemble, and have secondary machining. 6 auto cnc lathe machining. EDM, drilling and casting tooling manufacturing. After most of medical parts CNC machining, we will provide good finishing like anodizing, power coating and silk-screen. Most of medical parts CNC machining included rapid prototype and volume production, at first, we have to conside raw material must have ROHS, and get related test material certification like POM-C with nature color, 6061AL, etc. These medical parts must ask very clean machining process and good quality control under high standard, so it must ask our engineering and production team keep top standard to us. In order to get good parts, we must make these parts with finishing like polishing, anodizing etc. Also, we must make good packaging for each of parts under clean. We will ship these parts to our customers for assemble and testing out, and will follow each of details for parts function and testing requirement to meet customers, then get us timely comments for new parts improvement, will do next production more perfect and smooth. our aim is help our customers do best effective products, good quality and controlled cost as well as delivery time on time.